Blockchain technology sprung to centre stage in 2017, driving home the crystal-clear message that blockchain is far from a fleeting fad. That message has continued to gain traction in 2018. While usually associated with cryptocurrencies, Blockchain's disruptive applications go further than as a means to trade in Bitcoin. The decentralised electronic ledger has the potential to revolutionise everything from billing systems and digital contracts, to supply chains and electronic medical records. Even the ASX has hopped aboard the Blockchain Express, replacing its CHESS system to record changes in shareholding with the distributed ledger technology found in blockchain. DigitalX Limited (ASX:DCC) is a forward-focused fintech company well-versed in crypto and in blockchain’s game-changing power. DCC is the world’s first publicly listed blockchain company, so it comes as no surprise that its sharply honed corporate blockchain and ICO (Initial Coin Offering) advisory services are in high demand. The Perth-based company is quickly emerging as a leading force in the thriving blockchain and crypto ecosystem, harnessing years of industry expertise. Since we last checked in with DCC it has been moving from strength to strength. Most promising is the launch of its newly created investment division and crypto-asset investment fund, DigitalX Investments. This is an opportunity for DCC to leverage its finely honed expertise in blockchain technology and crypto-asset investment to unlock value for clients. This newly created business line will be captained by Tim Davies, a former Goldman Sachs associate director. DigitalX Investments will invest predominantly in the top ten cryptocurrencies including Bitcoin, Ethereum, and Ripple, with a smaller allocation towards special trading opportunities, including ICOs. Digital X can also invest in pre-ICOs to provide early-stage investors with exposure to the world’s sharpest blockchain projects. It should be noted that these are very high-risk investments and professional financial advice should not only be sought when considering DCC as an investment, but also sought if considering adding these asset class to your portfolio. On the same day it unveiled this new business, DCC also revealed a 50/50 joint venture with digital media company, Multiplier, to launch a new crypto business news website and online cryptocurrency education platform. This move will bolster DCC as the pre-eminent source of information for well-versed and sophisticated new entrants to crypto markets. Its crypto prowess, meanwhile, will be complemented by Multiplier’s public relations, reporting and business skills. Through the JV pairing two new websites will cover crypto and blockchain news and education: the recently launched Multipliercrypto.com and Coin.org, which will be launched in the not-so-distant future. Multipliercrypto.com is a digital news network for businesses within the Blockchain and cryptocurrency ecosystem. Coin.org will provide information designed to educate the market about Blockchain and cryptoassets. This will include curated video content delivered by industry experts and will highlight how to safely buy, sell and store cryptocurrency assets. The $60.8 million-capped DCC is in a sturdy financial position, reporting record-smashing net profit after tax (NPAT) of US$8 million in the first six months of the financial year, further verification that this fintech junior is only set to get bigger. 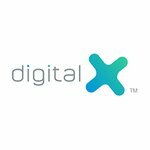 DigitalX (ASX:DCC) originally crept onto our radar back in 2016 and has been growing in leaps and bounds, rapidly emerging as a leading force in the flourishing crypto and blockchain space by expanding its lines of business. Below, DCC’s CEO, Leigh Travers discusses the company’s transformation over the past few years. We detailed the first and second of DCC’s business divisions extensively in our last article, DCC Emerges as Leader in Crypto Space: Clinches More High-Profile ICO Deals. Today, we’ll be taking a look mainly at the newest legs of DCC’s business: its recently honed crypto-asset fund management and blockchain education/news facets. This comes as it continues to clinch more in the way of high-profile ICO and blockchain advisory and consulting deals. DCC has been appointed corporate advisor for the ICOs of Shivom, which aspires to be the largest genomic data-hub platform in the world, and Bankorus, the world’s first private wealth management platform for high net worth investors powered by artificial intelligence (AI) and built on the blockchain. The global blockchain market itself is expected to grow from US$411.5 million in 2017 to US$7,683.7 million by 2022. That’s dwarfed, however, by the high-net-worth market, which is estimated to be worth more than $60 trillion. Although it is difficult to determine how much of this market DCC will be able to capture, so investors should take into account all publicly available information before making an investment decision in this stock. DCC is also lending its blockchain expertise to ShareRoot (ASX:SRO), which works in the rapidly growing field of User Generated Content (UGC) marketing, and Transcendence Technologies (ASX:TLL), which operates the prominent E-Collate data management platform. All in all, that’s some fast and strategic work for one ASX small-cap. So let’s break down this news in more detail. It is not just the company’s impressive crypto assets that are expected to appreciate in value, DCC is rapidly growing its ICO corporate advisory services too. These services were the primary generator of the company’s cash inflows of around US$1.7 million in the last quarter. With this in mind, it should come as no surprise that DCC signed three new ICO advisory mandates with the following companies: Bankorus, Shivom and Human Protocol. In addition to these projects, DCC has taken up two more ICO advisory mandates from the following organisations: Mosaic and Bamboo. DCC has also taken on a number of new blockchain consultancy projects, as the demand for companies seeking to integrate blockchain technology into their current business models grows. DCC has blockchain consulting contracts with Transcendence Technology Limited (ASX:TTL), ShareRoot Limited (ASX:SRO) and the Canberra based strategic consultancies, ThinkPlace. The company is reviewing ShareRoot’s product offerings and will explore how distributed ledger technology can be integrated into ShareRoot’s current business model. Ultimately, as both the crypto and ICO markets recover, DCC expects to grow its revenues through the offering of these vital consulting services. The creation of a crypto-based investment fund was first announced in April. This fund, named DigitalX Investments, will be helmed by Tim Davies and invest primarily in crypto assets and promising ICO projects. Tim has a history in global finance and the investment industry and will prove to be an invaluable resource for DCC going forward. The fund aims to target high net-worth individuals and institutional investors who wish to gain access to a diverse range of crypto assets. As it stands, DCC holds a 73% stake in DigitalX Investments, and has already seeded the fund with $750,000 – generated from the sale of DCC’s holdings of Ethereum and Bitcoin. In addition to the company’s soon to be launched fund, DCC, in a joint venture with the company Multiplier, has launched one crypto-focused website and is about to launch another. The first website, Coin.org, focuses on educating the market in blockchain and crypto assets. 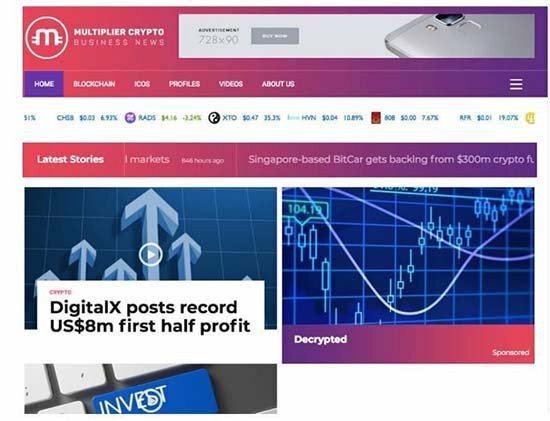 The second website, Multipliercrypto.com serves as digital news network for businesses within the cryptocurrency space. Many people dubbed 2017 the year of the ICO. But by the look of things, 2018 could be even bigger. 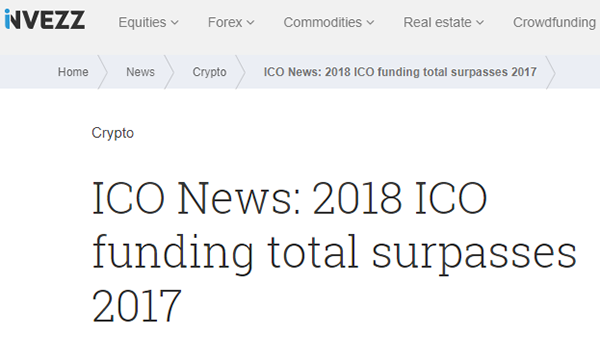 The investing website Invezz has astonishingly pointed out that the funding for ICOs in 2018 has already surpassed the total funding achieved during 2017. Better still, not only is the ICO market growing faster than ever before, but as the Irish Tech News reports: the ICO market now places a much greater emphasis on transparency, accountability and protecting investors. Add to this maturing ICO market the restored faith in blockchain-based tech and you have a powerful setup for companies such as DCC working in both the ICO and cryptocurrency spaces. The following article from Forbes, looks at the potential for some of the top cryptos to surge even higher this year. This article from Cryptocurrencynews examines three bullish reasons for another crypto uptrend. DCC’s prudent financial management has put the company in a strong financial position in 2018 and we look forward to its next lot of results. Even though the crypto asset market fell around 56% from December 31 2017 to 1 April 2018, DCC actually managed to increase its cash position by 30% in this period, from roughly A$4 million to A$5.3 million. Finally, as it stands the company continues to hold a significant number of crypto assets, many of which have rebounded strongly in the past month. For example, already since releasing their quarterly report on April 30, Bitcoin has risen 29% and Ethereum 84%. Although these asset classes are volatile and DCC remains a speculative stocks itself, so investors should seek professional financial advice if considering DCC for their portfolio. Where is DigitalX heading next? With sentiment turning bullish once again, the ICO and cryptocurrency space could see significant gains in the coming months as demand for crypto services and public interest in the sector heats up again. This is great news for companies like DCC. Not only is DCC poised to launch its crypto-focused fund, but its partnership with the world’s largest crypto exchange Bitfinex could also open the doors to a host of new and exciting opportunities in 2018 and beyond. Better still, if crypto assets were to see another decline, DCC is well diversified with with include ICO and blockchain consulting as well as news delivery and education, meaning the company is positioned to prosper in both good times and bad. Indeed, this diversity coupled with the company’s healthy cash position and impressive holdings of blue-chip crypto assets means DCC looks set to continue delivering stellar value to shareholders this year — just as it did in 2017.